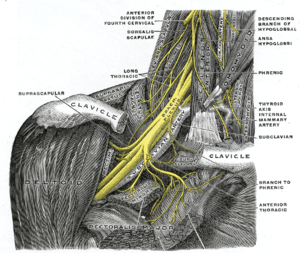 Thoracic Outlet Syndrome (TOS) comprises a variety of symptoms caused by abnormal pressure on the neurovascular bundle between the neck and the lower end of the armpit – the thoracic outlet area. The neurovascular bundle refers to a group of nerves (the brachial plexus) and blood supply (subclavian artery and vein). This bundle supplies the fingers, hand, arm, shoulder girdle and some regions of the head and neck with circulation. Nerve compression is more frequently involved than restriction of the blood supply. The most common symptoms are swelling or puffiness of the hand and fingers, dull achiness in the neck and shoulder region (especially at night), sense of fatigue in the arm, pain in the hand (especially in the fourth and fifth fingers), muscle weakness with difficulty in gripping things and when doing fine motor activities and tingling and numbness in the neck, shoulder, arm and hand. Doing activities with the arm elevated, such as combing or blow-drying hair or driving a car, also causes the above symptoms. And finally, it is not common, but some people may be born with an extra rib above their first rib, creating compression in the area. Aggravating Factors. TOS often results from poor or strenuous postures, trauma or static muscle tension in the shoulder area. Occupations affected most are those requiring repetitive movement and posture such as cashiers, assembly line workers, plasterers and electricians. It can also occur in people who stock shelves or do needle work. Athletes who play volleyball, swimmers, tennis players or baseball pitchers can all be affected. Musicians, particularly violinists, are also susceptible to this condition. Carrying heavy loads, children, briefcases, purses and daypacks over one shoulder can aggravate TOS as well. Self-health Measures. It is important when someone experiences discomfort that suggests nerve involvement such as numbness, tingling, puffiness or other similar symptoms in the arms or legs, that he seek medical attention for an accurate diagnosis. With that said, treatment for TOS responds well to manual therapy such as massage or physical therapy and stretching exercises. It is also necessary for the person to look at his activities of daily life, occupation and athletics to determine which postures or biomechanics need to be modified in order to alleviate the symptoms and make a more permanent change. Sitting erect with lumbar support. This keeps the shoulders back. Avoid sleeping on the affected side. Avoid folding or crossing your arms. Taking breaks every 15 to 30 minutes from repetitive work which has you bent slightly forward. Avoid lifting things above shoulder level. Gallery | This entry was posted in Energy Medicine, Holistic, Holistic Healing, Integrative Shiatsu, Massage, Our Center, Raindrop Technique, Therapeutic Massage and tagged Conditions and Diseases, Health, Nerve compression syndrome, Neurological Disorders, Shoulder, Thoracic outlet syndrome. Bookmark the permalink.